Game of Thrones Review: "Lord Snow"
The Starks and Royal Family finally reach King's Landing, followed shortly and in secret by Catelyn. Jon Snow reaches the Wall and the reality of the the Night's Watch. Want to learn more about Game of Thrones? Check out our review, recap and quotes! Game of Thrones Preview: "Lord Snow"
Watch a promo for next week's Game of Thrones adventure, "Lord Snow." While Ned and his daughters join the King on a two month journey on "The Kingroads," we sit in our comfortable chairs and analyze Game of Thrones in our Round Table. Ned, Arya and Sansa sense a hint of what life at King's Landing will be as they travel the Kingsroad with the royal family. Catelyn learns Bran's accident may have been more sinister than originally thought. Read on for details! 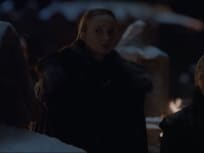 Game of Thrones: News & Clips From "The Kingsroad"
Two incredible clips of this Easter Sunday Game of Thrones episode and some great news from HBO! Game of Thrones Preview: "The Kingsroad"
Watch a promo for this Sunday's episode of Game of Thrones, "The Kingsroad." Game of Thrones: Already Renewed For Season 2! Game of Thrones has been picked up for a second season just two days after it premiered. HBO has a lot of faith in the new series. Game of Thrones Round Table: "Winter is Coming"
Join us in our inaugural Game of Thrones Round Table as we dissect the premiere, "Winter is Coming." In this breathtaking series premiere, we're are given a glimpse into the mythical world of Westeros and Kings Landing. Read the review for a better insight of what to expect. Game of Thrones Season Premiere Clips: Let the Games Begin! Game of Thrones starts this weekend, and if you haven't had a chance to see the first 15 minute preview on HBO, we have something better. Five clips to get the juices flowing. When given the opportunity to chat with Dan Weiss and David Benioff, writers and producers of the upcoming Game of Thrones, you gain a new respect for them, their process and what's to come on the epic series.